Cheesecake is a holiday favorite in my family. My mom has been making it for holiday parties longer than I can remember. For my office holiday party this year, I kept the family tradition alive and made my own version of mom's cheesecake by adding a little bit of white chocolate. Not only is there white chocolate IN the cheesecake, but there is also white chocolate ON the cheesecake. The white chocolate in the cheesecake is very subtle so the extra chocolate on top helps boost that white chocolate flavor so people aren't confused about what they are eating. Let's start with the crust, shall we? Because this is not your ordinary graham cracker crust. Although that would also be very nice. This is a Biscoff cookie crust. You know the cookies Cookie Butter is made out of? The cookies have a nice cinnamon spice flavor to them which is perfect with the white chocolate. Like a graham cracker crust, I first smashed them into bits with my handy food processor until the cookies resembled something between breadcrumbs and sand. Then I mixed in some butter so that all the crumbs would stick together and poured them into the bottom of a springform pan. To evenly distribute the crust around the bottom of the pan, I, first, used my hand to cover the bottom. Then I used the bottom of a heavy glass to tap them down into a smooth crust. For the cheesecake itself, I first creamed together the cream cheese and the sugar until they were well combined. Next came the eggs. Cheesecake requires lots of eggs, but I am too impatient to mix them in one at a time. So I just do three at a time. Last, I added in vanilla (in this case, vanilla bean paste) and sour cream. Finally, I poured the batter into the pan and evened out the top before popping it in the oven to bake. Now, cheesecake takes a little while to bake, so this is typically where I clean up a bit, check email, browse Instagram, etc. until it's done. You will know your cheesecake is done when it is slightly brown around the edges but still has a little wobble in the middle. The center shouldn't be "wet", but it will still wobble. If your cheesecake is browning too much around the edges, then cover it with foil and continue baking. After the cheesecake baked, and while it was cooling, I prepared the white chocolate ganache topping. I poured hot heavy cream over the white chocolate and let that sit for a bit to begin to melt. After a few minutes, I stirred the ganache to make sure all the chocolate pieces had melted. Then I stirred in some butter. Once the ganache had cooled to room temperature but was still liquid, I poured it over the cheesecake. At this point, my cheesecake had already cooled to room temperature, so it was safe to cover and pop in the fridge. You never want to put a warm cheesecake in the fridge, otherwise, the crust and the center will get really soggy and not set properly. I let the cheesecake and ganache set overnight in the fridge so that it was ready the next day for the Christmas party. To dress her up a bit, I added some rosemary, sugared cranberries, and mint around the outside for a holiday wreath look. Actually, this look was just for photos. When I reassembled the cheesecake at work, I put the cranberries and mint right on top, like you can see here on Instagram. Either way, I think it's a beautiful holiday dessert and it's delicious, too! To the work bowl of a food processor add the Biscoff cookies. Pulse 10 to 15 times until the cookies have turned to crumbs. Turn the food processor on low speed and drizzle in butter. Pour the crumb mixture into the bottom of a spring form pan and distribute evenly across the bottom. Use a glass or your hand to press the crumbs into a crust along the bottom of the pan. Set aside. In a large bowl, beat together the cream cheese and sugar until thoroughly whipped. 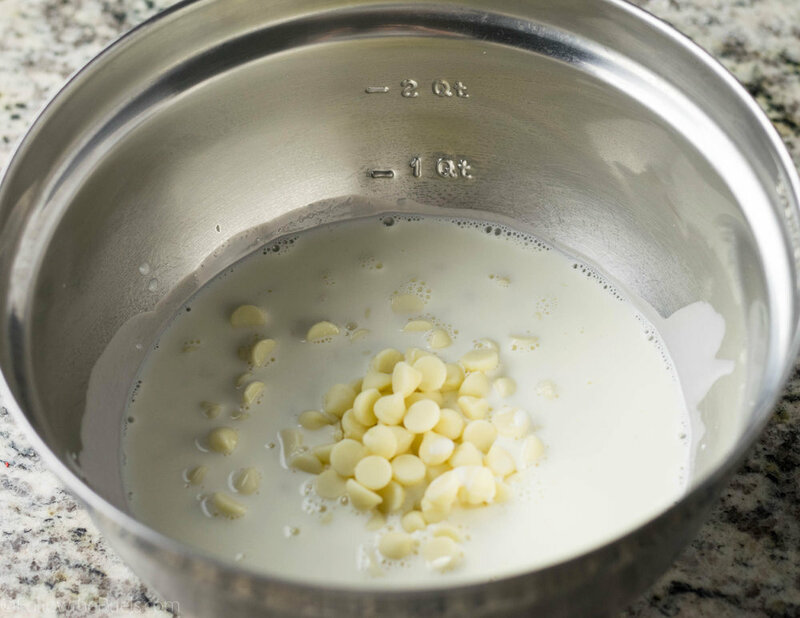 Pour in the melted white chocolate and mix to distribute through the cream cheese and sugar mixture. Mix in the eggs, three at a time. Then mix in vanilla and sour cream. Pour batter on top of the crust and use the back of a spatula to even out the surface. Bake for 70 to 75 minutes, until the edges are golden brown and the center has a slight jiggle. If the top starts to brown too early, spray one side of a piece of foil with baking spray and place the foil on top of the of the cake. Remove the cheesecake from the oven and allow to cool to room temperature. About 2 hours. Meanwhile, make the ganache. Pour the white chocolate into the bottom of a bowl. Heat the heavy cream in the microwave for about 60 to 90 seconds until it is very hot. Pour the hot cream over the chocolate and let sit for 5 minutes. Stir the chocolate and cream until smooth, then stir in the butter. Let the ganache cool to room temperature. About 10 minutes. Pour the room temperature ganache over the cheesecake. Then top the pan off with plastic wrap or tin foil. Place in the fridge to cool for at least 4 hours, but preferably overnight.